Been to New Westminster lately? If you haven’t been there, what images first comes to mind? Are they positive or negative? If they’re negative, you’d be in for a surprise with the changes that have happened in the city. Big changes. New Westminster was once the pride of British Columbia. It was proclaimed by Lieutenant Governor Richard Moody in 1859 to be the official capital of the Colony of British Columbia. It was official recognized as a city in 1861, exactly 25 years before Vancouver was established as a city. A lot of history is in that town which currently has a population of over 65,000. It was seen as a great pathway with being located by the Fraser River. Excellent for transportation of goods through the waters and great links by rail service. It’s area rich in trees was especially beneficial for the logging industry and for the pulp and paper industry. Many pulp and paper mills were build around New Westminster and the Fraser River. Its railway system would also be built around the various mills. As many of you have noticed in your own cities, the older buildings would face a neglect for some time. Much during the 60’s and 70’s. New Westminster faced a neglect during the 80’s and 90’s. A lot of the times the areas would be some of the sleazier areas of town often the scene of drug deals or crime. Even the older buildings would start to look shabby over time. The area around New Westminster Skytrain station used to be a popular hangout for young thugs. Some former residents of New West may remember that. One thing many people will notice is the many improvements made in New Westminster over the last ten years. Columbia Street has definitely made big improvements in the last ten years. Before 1964, Columbia St. used to have many department stores and was the downtown attraction of New Westminster. The area consisting of the major stores around Columbia St. which also linked with South Burnaby and North Surrey was known as the Golden Mile. That changed after 1964 when the Highway #1 freeway was completed and allowed people to travel to Vancouver faster. Many of the department stores along Columbia St. closed up and moved themselves to the Uptown area. The nearby landmarks like Douglas College, the Courts and the City Hall were the places still keeping it active mostly. Things really improved since Wayne Wright became mayor of New Westminster in 1999. Columbia St. has recently gone under a ‘facelift’ in the last ten years. One of the things Columbia St. is noted for is their array of wedding and bridal shops. It has become a major area for wedding planning and fashion. Housing along Columbia St. has also sprouted out with new developments happening. Even older buildings were renovated or given new life for attracting new and current businesses. There’s even an annual automobile festival in July, the ‘Key West Show & Shine’, that attracts people to the street. The Plaza 88 Shopping Mall (shown here) and condo development has helped to give new life to the New Westminster Skytrain Station and Columbia St. The biggest boost on Columbia St. was the Plaza 88 along the New Westminster Skytrain station. A multi-storied condo was built there five years ago with the anticipation of an adjacent outdoor shopping mall along the Skytrain levels. 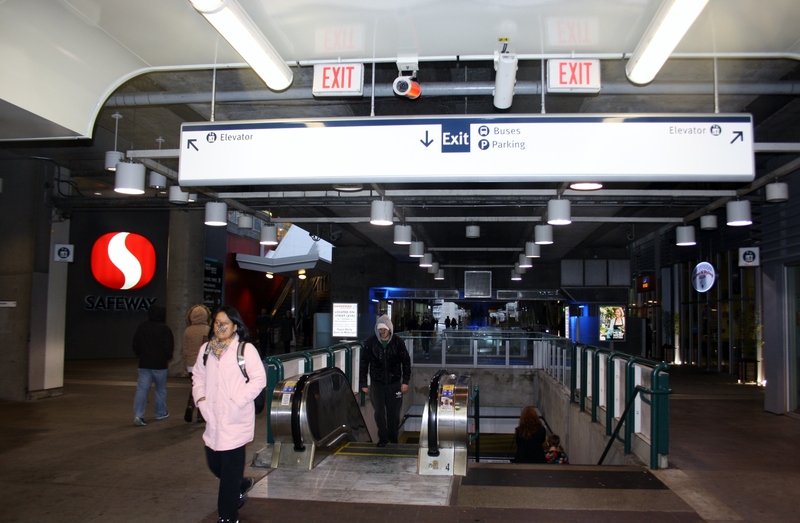 Back in winter 2011, the New Westminster Skytrain station opened Plaza 88 and has since become a common shopping place with a Safeway and a Shoppers Drug Mart. A movie theatre opened there last year as well as various other stores and medical businesses and new businesses continue to come in. Ten to even five years ago, the area was very run down full of old crumbly buildings and was a common hangout for people into drugs or causing trouble. Now the place makes for a for comfortable setting for people and even includes a play area for children. Another bustling area is the New Westminster Quay market alongside the Fraser River. The Quay market had a slow period roughly six years ago as businesses left many vacancies behind. A major renovation of the market area from July 2007 until its reopening in September 2010 has succeeded in attracting new businesses in especially with having an ‘anchor store’ with Donald’s Market. 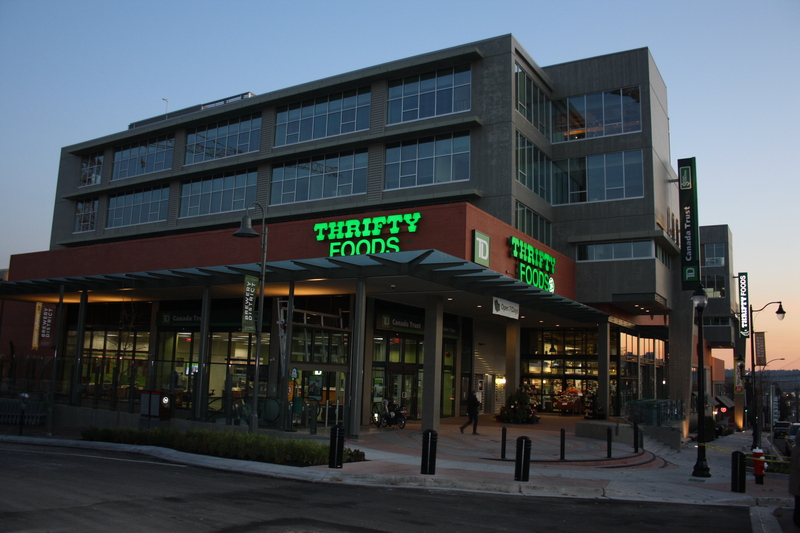 The addition of new buildings and new stores like Thrifty Foods has helped give new life to the Brewery District since the brewery closed in 2004. Another redeveloped in New Westminster as of recent is the Brewery District. The Brewery District used to be the pride of the town of Sapperton after the Sapperton Brewery was opened in 1879. The brewery was owned by many brewing companies with Labatt’s Brewing Company being its last one in 1958. The brewery was closed in 2004 after Labatt’s decided to withdraw its business. The area that used to be part of the brewery has been redeveloped in the last few years. The area was recently revived with the opening of a Thrifty Foods and a Toronto Dominion bank. A Brown’s Social House restaurant and a Shopper’s Drug Mart were also opened months ago. Nearby is the office for the Greater Vancouver Transit Police and Translink with office room for more businesses. There’s already a condo area in existence to the surrounding area and more homes are planned in the years to come. Even with the surprising news in the past two months of Thrifty Foods being sold by its umbrella company Sobey’s, the area still shows potential for consumer business to increase over time. It isn’t just new buildings and businesses that New Westminster is proud to show off. Recently it has also developed a sense of pride for its past. Back in 2009, the Royal City celebrated 150 years. The Irving House on Royal St., now a museum, is its most classic building and open to the public and even has a Victorian style Christmas. The New Westminster Heritage Centre runs guidelines for running and developing its classic homes and buildings. This allows for buildings like the BC Penitentiary to be converted into an office or even the CPR station on Columbia St. to be converted into a Keg Restaurant for some time. There are also tours of heritage homes which still keep their own facades and designs despite renovations and modernizations for current occupancy. The New Westminster Mayday festival started in 1870 and still continues today as a tradition with participating children still wearing the traditional uniform and dancing around the maypole. 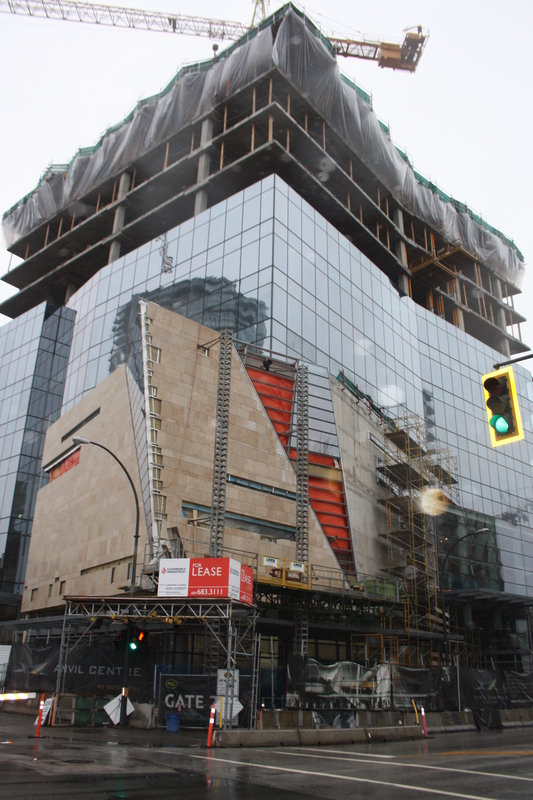 The Anvil Centre situated across Plaza 88, slated to open later this year, is to be the city’s new civic centre. It’s not only what has been completed in the last five years or past buildings and traditions revamped that has caught a lot of buzz for New Westminster but also what’s planned for the future. Being constructed nearby Plaza 88 will be the brand new New Westminster Civic Centre or the Anvil Centre as it’s commonly called now. That area too was once part of an area that had a lot of old buildings that were also looking run down and also a common spot for homeless people and drug addicts to loiter around. The centre is designed in the shape of an anvil commemorating the Anvil fired off annually during the Battery Salute of the annual Hyack Festival. The centre which is expected to open next year promises a 350-seat theatre, art studios, multi-purpose rooms for arts and performing arts development, a conference space with banquet seating for up to 500, a new location for Tourist New Westminster on ground level, and a new home for both the Canadian Lacrosse Hall of Fame and Museum of New Westminster. There was one negative note. Back in October there was a fire that burned down the E.L. Lewis Building, one of Columbia St.’s older buildings still put to good use. The fire devastated the building and surrounding area leaving 30 businesses displaced. It was an unfortunate happening. This could however lead to promise of a new development in terms of businesses or housing. New Westminster has developed a new sense over the years. It’s a city with a proud and celebrated past with a highly ambitious future. Despite the negative impact in the past 20 to 30 years, the city has made big improvements and promises more in the future. The Royal City is becoming Royal again. For more information about New Westminster, click the link to the official website. It’s happening. British Columbia will be voting for a premier: the first such election in four years and two days exactly. There’s reigning BC Premier Christy Clark and there are challenging Party leaders, most notably Adrian Dix and Jane Sterk. But how do they stack up for the vote on May 14th? She is the reigning premier, albeit not elected into office. Those of you living outside of British Columbia may not have known the state of politics in the 21st century. From 2001 to 2011, the province has had Liberal Gordon Campbell as premier of the province. He has been elected into office three times having to resign back in 2011 because of his approval rating declining to the point of single-digit percentage. Christy Clark has taken the role of premier ever since. Since becoming premier of BC, her approval rating as well as the approval rating of the BC Liberals improved greatly even superseding the rating of the NDP for some period of time. However the period has been short-lived. The opposition Clark has faced during her premiership has not been as heated or intense as Gordon Campbell’s. Nevertheless she has faced heat of her own. One former Liberal MLA accused her of conflict of interest in assisting with the selling of BC Rail during the Campbell administration while cabinet minister. She has also been witness to seeing many key Liberals resigning from parliament. With the provincial election approaching, Clark still faces a lot of heat from the opposing parties for a lot of what Gordon Campbell did during his administration. Remember I told you about her pre-election baggage? It didn’t completely go away. Her appearance at the Party leader’s debate gave her a chance to improve her political reputation as many felt she won the debate. The BC Liberal Party has greatly decreased its gap behind the BC NDP in the past three weeks trailing them only slightly. However many journalists are claiming it may be too much too late for her political career. Only the results on Tuesday will tell. He’s already been written as the frontrunner for the race for premier. But it doesn’t mean that his chances of winning are unbreakable. One of the reasons many claim Gordon Campbell has continued to be elected premier is because there hasn’t been an NDP skilled enough to rival him. Adrian may not have much experience as a Party leader but he does have considerable political experience under his belt. Dix was born the son of an insurance agency owner. He has been with the NDP Party since 1996 and like Clark has also been a political media personality for newspapers like The Sun Columnist and the Source. Dix has been the MLA for Vancouver-Kingsway since his election in 2005 and his prime areas of focus while MLA have been Children and Families and Health Issues. His biggest achievements have been bringing insulin pumps to children with type 1 diabetes and successfully preventing three Vancouver-Kingsway schools from shutting down. He came to be elected leader of the NDP Party in 2011 upon the resignation of leader Carole James. Issues that led to his election have been Eliminating the HST, reducing business taxes, redirecting carbon tax, and increasing the minimum wage to name a few. For the provincial election, Dix has had ads marketed with the theme ‘time for a new government’. Those ads have been on television not as frequently as the BC Liberals but more commonly on Youtube. Dix has led through most of the pre-election polls and appears to be the heavy favorite to win. However he does face stiff opposition. Firstly there was the recent Party leader debate where Christy Clark presented herself and her platform the best. That caused her to jump in the polls and even tied Dix on May 8th. Then there was bringing back the controversy Dix was responsible for during the scandal of 1990’s premier Glen Clark when Dix was Chief of Staff from 1996 to 1999. Back then he back-dated a memo to protect Clark from conflict-of-interest charges. That led to the resignation of both Clark and Dix. Dix has since redeemed himself as the MLA for Vancouver-Kingsway but the incident has arisen again by the opposing parties. That could hurt him. Yes, Dix has a lead over Christy Clark in the polls right now but it’s too close to call right now. Don’t forget polls can say one thing and elections can say another. The big question is will it be a night for the first NDP premier in 12 years? It will all be at the buzzer Tuesday night. Outside of the Liberals and the NDP, the only other Party making the biggest news in the election is the BC green Party and its leader Jane Sterk. The Green Party is a relatively young Party that started in 1983 but it fields policies that appeal to many BC residents like environmental issues, tolerance and diversity, social justice as well as personal and global responsibility. The questions has always been would they have what it takes to win elections and would they have what it takes to be good strong leaders? The Green Party first made a name for itself under the leadership of founder Adrianne Carr back in 2001 when the Party finished third in the provincial election with 12.4% of the vote. They would continue to finish third in the next two provincial elections but with declining percentages of votes. In the 2009 election–the first in which Jane Sterk was Party leader– the Green Party finished with 8.1% of the vote and no seats. The position of the Green Party here in BC is still a big question mark. Even in this election the Party won’t be fielding candidates for all 85 ridings like the NDP and Liberals: 61 to be exact. However this could be the Party’s best election. Right now the election is between two leading Party’s candidates who have both been involved with a former premier and the infamies of their administrations, even scandal involvement. The Green Party has been over 10% in the polls for most of the upcoming election period however their popularity has taken a bit of a dip in recent days. Also what should be remembered is that Sterk is native to Alberta and she didn’t move to BC until 2000. That could hurt her since the leading two candidates and many other candidates have spent most of their life in BC. The question is will the Green Party finally make a name for itself and be able to land its first ever MLA seat? Best chances could be with Sterk in her Victoria-Beacon Hill riding but she would have to win over former NDP leader Carole James who is the incumbent leader in that riding. This will be a question not just of whether the Green Party can land a seat but its ability to strike a chord with voters. It has what it takes and now’s a better time than ever but can they do it? The Conservative Party is a long-standing Party like the NDP and Liberals and had it’s biggest heydays from the 30’s to the 50’s. However it has had rollercoaster success since then as the Party has had a very hard time not just trying to win seats but also trying to field seats. This year the Conservative Party has fielded candidates for 56 of the 85 MLA seats, their biggest number since 1972 and double the 24 seats they fielded candidates for in the 2009 election. Its biggest challenge has to be with the general public. I live in New Westminster and work in downtown Vancouver. Already I can tell that the big cities are not known for welcoming politician with a right-leaning platform. Most of the bigger cities have a huge and very vocal animosity for right-wing politicians that are even as much as right-to-centre. Sometimes I think Vancouver is the capital of ‘Harperphobia.’ However it’s another story in areas like Langley and Abbotsford which are known for its conservative beliefs. In fact leader John Cummins is running in the Langley riding. Cummins himself is a former MP in the Canadian Parliament under the Reform Party and the national Conservative Party under the leadership of Harper. He resigned his seat in the Richmond-Delta national riding to pursue provincial Party leadership. This could be the first chance in decades for the Conservative Party to make a name for itself in decades however it does face opposition of its own especially from BC residents that disagree with the Party agenda very vehemently. Like the Green Party, it too has had times where it has seen days of 10% approval or higher this past month. Also like the Green Party, it’s currently sitting below the 10% mark. There’s no question that it will have a higher percentage of votes than the 2.1% received in the last election. The question is not only what percentage of votes will it receive but also what will Tuesday’s results tell for the future of the Conservative Party? Only the four parties I mentioned above have candidates running for more than half the MLA seats in the BC parliament. Actually only those four have candidates running in even as little as ten provincial ridings. The biggest Party with less than ten candidates in the running is the BC Libertarian Party. If you go to their website, you will see that the BC Libertarian agenda has a lot in common with the agenda of the American Libertarian Party. Libertarianism is still a definition that’s hard to define in terms of a political stance. Bill Maher, possibly the most famous Libertarian right now, defines a libertarian as a ‘pothead in a business suit.’ For the BC Libertarian Party, just go to their website. The Libertarian Party of BC started in 1986 with three candidates and rose to 17 upon the 1996 provincial election. There would be no Libertarian candidates back in 2001 as Party president Paul Geddes ran for the BC marijuana Party. In the provincial elections since, the BC Libertarian Party has been putting efforts into reestablishing itself. In both previous provincial elections, the Party fielded six candidates and achieved just under 1500 votes both times. This year the Party field eight candidates including one in my riding of New Westminster. This could be the Libertarian’s best election since 1996 when they had 17 candidates and won just over 2000 votes. However lacking a Party leader could cause some problems. Plus its lack of advertisement to the public could make a lot of people unaware of Libertarian candidates in their area. This election should give a picture of where things are going for the Party. Of all the candidates running, the most interesting should be the Independents: those that won’t be running for a Party or its agenda. Independents have always been unique candidates as it has always been a case of the politician promoting their agenda that’s often unique in comparison to most formed parties’ agendas. Last year one independent candidate–Vicki Huntington of Delta South– was elected MLA. Most interesting is that since the 2009 election, two NDP MLAs and one Liberal MLA have become independents themselves. Three of the four incumbent independent MLAs will be running in this election. This election will see 35 independent candidates running for MLA seats in 31 ridings. Each one will have their own unique agenda and/or run for their own purposes. Many have run for some of the major parties in the past. And one, Kelowna-Mission’s Dayleen Van Ryswyk, was running for the NDP three weeks ago but had to resign from the Party because of past comments that appeared bigoted in nature. She started her campaign as an independent the next day but has recently hired a bodyguard for fear of threats. Tuesday could give a surprising glimpse as the independents could win some seats and could provide an outlook on the political culture of BC. And there you have it. A brief rundown of the candidates for the 40th British Columbia General Election. Sure, I could talk about all the other fifteen political parties but it would be too tedious. Remember there are 85 MLA seats in BC’s parliament and the winning Party is the one that wins 43 seats for a majority. You can click on the Wikipedia link–which also happens to be my Works Cited page– here to get all the info of who’s running and which parties. So on the 14th, will it be Premier Clark elected into office or will Adrian Dix be elected BC’s new premier? Stay tuned! Some of you may remember a while back I did my own personal rundown and observation of the HST referendum in British Columbia. It was done just a few days after the last mail-in day. However the wait to find out the final result seemed to take forever. Nevertheless the result was made public since Thursday. 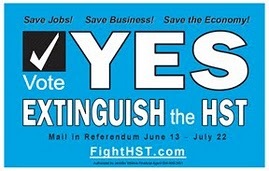 The citizens of British Columbia voted ‘Yes!’ to extinguishing the HST. The decision was 55%. However there are many economists that believe that reverting from the HST back to the GST/PST system will have both positive and negative impacts. On the positive side, many businesses will like the reversion back to the GSTR/PST system. I myself have heard of many business owners talk of how unhappy they are with the HST system and how it cost their business. In fact a recent article in the Vancouver Sun written by Don Cayo said that restaurants and the builders of high-end homes should the most notable businesses to win big with the reversion. The total tax customers pay retailers will definitely boost sales businesses. Customers themselves will now have to pay less like they did in the days of the PST/GST. Even though it was noted a while back that businesses should will big on the customer end of things, they will face higher costs as the PST they pay on the items they buy to run their business will either be swallowed or more likely passed to customers. Even back in the original days of the PST, there were some mind-boggling complexities like in the case of tax exempt items like children’s clothes or for women’s dress fabric. Also one economist pointed out it will cost $30 million to reinstate an infrastructure that was split. Also under the HST, businesses could report and remit taxes twice a year instead of multiple times with the split tax system. There’s even the case liars may take advantage of the old system again. Even in the case of manufacturers, costs they used on materials are rebated with the HST but weren’t in the PST days. As a BC citizen, I too know about experiencing the HST. As annoying as it is to pay 12% on things that used to be only 7% or 5%, I am open to insights on both sides of things. I’m glad Cayo repeated those points that were commonly spoken by economists and business people. Whatever happens in the future, it will be a gradual process. BC Premier Christy Clark promised that the HST will be extinguished by March 31, 2013. What it paves for the future of British Columbia, only time will tell. Hi. I know it’s been a while since I wrote something, especially of substance. So here I am getting back into the swing of things with my latest article. Hope you like it. If you’ve lived in BC this past year and a half, you may have known for a long time about the most heated three letters in the province: HST. The tax came from nowhere, became part of BC faster than you think and is now up for public vote after a year of existence. The tax and the craziness surrounding it is both frustrating for the citizen and cartoonish in the media’s eye. Even more surprising is that the referendum involving the HST isn’t your typical ballot-and-booth referendum but a mail-in referendum lasting a full month. Most BC residents may not know a whole lot about this Harmonized Sales Tax but it sure has been far from harmonious in BC. What few people know is that British Columbia is currently one of five provinces with an HST. The others being New Brunswick, Newfoundland and Labrador, Nova Scotia and Ontario. Actually it was the Atlantic Provinces who worked back in 1996 in having a Harmonized Sales Tax implemented in order to lower the amount of tax a citizen would have to pay. This resulted in a 15% HST that came into existence on April 1, 1997. When the GST lowered to 6%, the HST went down 1% to 14% and would go down to 13% when the GST was reduced to 5%. It was noticed that the price of goods fell when the HST came in. In fact one of the things in changing from a cascading tax to a value-add tax was to reduce income taxes, and instituted direct transfer payments (refundable tax credits) to lower-income groups, resulting in lower tax burdens on the poor. The benefits of the HST were appealing. Even Prime Minister Stephen Harper government said of tax harmonization: the single most important step provinces with retail sales taxes could take to improve the competitiveness of Canadian businesses.” However it was in 2010 when the HST was implemented in BC and Ontario that the drawbacks came to light. It made businesses hard to manage and property values hard to maintain. Many food expenses which had either to the one tax or neither tax became more expensive. The price of gas increased. Services like haircutting and dry cleaning which had only one tax saw the raised price. Some items in BC, like public transportation, ferry costs and toll-bridge tolls. Children’s clothing, child-care items and feminine hygiene items were also exempt. Nevertheless the expenses that were already added were noticed soon enough. In BC, the brouhaha about this tax is not just simply its existence but its introduction and implementation. It was first reported back in June 23, 2009 that the BC government under the leadership of Gordon Campbell intended to harmonize the two taxes. Full attention to this tax didn’t come until after the 2010 Winter Olympics in Vancouver had ended. Before it was to be implemented on July 1, 2010, the raucous was not only raised by BC citizens but former premier Bill Vanderzalm in campaigning to get the HST abolished. After the HST was made official in BC, Vanderzalm still continued on his campaign while Gordon Campbell’s popularity soon dipped to single-digit percentages, leading him to retire. Now the fate of the HST lies in the hands of the citizen of British Columbia. All registered BC voters including myself were sent a mail-in yes/no ballot in which one is to vote not on keeping the HST but on abolishing the HST. The deadline for mailing in the vote was Friday July 22nd. During that time, there has been many pro-HST and anti-HST rhetoric. Those against the HST would speak of their drawbacks, most notably the increase in expenses for BC citizens and the businesses that have either faced huge economic difficulties or closed. The common citizen should also have its own experience with the HST in the past. Those for the HST have come from economics or other sources that have studied the HST in the past. On May 4, 2011, an independent panel commissioned by the BC government released a report on the impact of the HST in BC. The report concluded that “Unless you are among the 15 per cent of families with an income under $10,000 a year, you’re paying more sales tax under the HST than you would under the PST/GST: On average about $350 per family.” The report also predicted that by 2020, the HST is anticipated to result in a BC economy that will “Be $2.5 billion larger than it would be under the PST. That’s about $480 per person or $830 per family.” There was even a prediction from the University of Calgary that the HST will lead to 600,000 more jobs in the next ten years. Economists have even spoken of the potential damages and drawbacks that could happen if the HST is abolished. Anyways the referendum is over. If you didn’t mail your ballot in by now, tough cookies. Time will tell what the result of referendum will determine. Time will also tell which tax system was supported by the people and whether it will pay off in the long run. Stay tuned. The future of BC and its economy will be decided. Many expect this to be a benefit for the province but there are just as many drawbacks that could happen too. Just days after Christy Clark was sworn into office as the new Premier of British Columbia, she starts her reign by announcing that British Columbia will have an increase in the minimum wage. 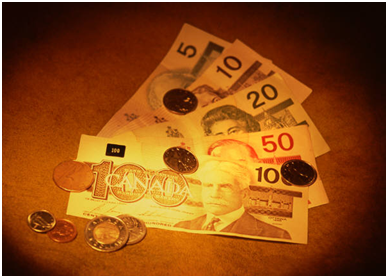 For around ten years, the minimum wage has stood still at $8/hour: the lowest rate in Canada. This especially doesn’t fare well in the Canadian province with the highest cost of living. Clark announced that the wage will be increased in 75-cent increments starting May 2011 to an eventual $10.25 come 2012. The raise has had a lot of mixed reactions. For many, it’s looked upon as a positive thing. As I mentioned earlier, BC has the highest cost of living of any province in Canada. The $8/hour was the highest in Canada at the time it was set (May 2000) and has now dropped to the lowest. Many have called the low minimum wage an embarrassment for the province. The plan from Christy is to start the raise in May 2011 to $8.75/hour, increase to $9.50 in November and finally $10.25 come May 2012. That would place it equal with Ontario as having the highest minimum wage amongst Canadian provinces. The highest minimum wage including territories is Nunavut with $11/hour. Since her declaration, there have been many opinions from people from all sides. Some say this is finally a good move for BC. Some claimed that this was an NDP idea she stole. Some say this is happening too much too late. Some are also questioning if this is a difficult move, epsecially during an economic recession. For every action, there are both positive and negative reactions. First the positive. For one thing, it will make life more livable for many BC workers who already deal with the minimum wage. BC, especially in Vancouver, has the highest cost of living based on provincial averages. Greater Vancouver alone has the highest housing prices in Canada. Gas prices are already at $1.30/litre. Vancouver has one of the worst child poverty rates in Canada. Already there’s talk of food prices going up worldwide. An increase to the minimum wage will help make life a bit easier for those trying to make ends meet in their own standard of living. It’s definitely not a solve-all but it does help. Also some argue that it could boost small businesses rather than hurt. With an increase in the minimum wage, it can mean businesses can have more customers. One economist even said that people with money generally spend in small businesses. One downside is that this could mean an increase in the prices of goods and services. I know that from when I worked in a restaurant in Manitoba, they had to raise the food prices because of the minimum wage increase. Also with the raise in the minimum wage comes the risk of some smaller businesses cutting some jobs to pay the wages. Already a lot of businesses, especially restaurants, have already been hit hard by the HST and with the tough new anti-drinking and driving laws. Even though I mentioned one economist saying that those with money tend to spend in small businesses, that’s not a complete guarantee they’ll prosper significantly. There’s even a possibility that the already-difficult cost of living in British Columbia could increase along with it. Another of Clark’s claims is that the cost of living would not increase dramatically. With the increase in the minimum wage, it’s a 50/50 risk that it may or may not. As stated, the first raise of the minimum wage begins in May 2011. The changes, whether positive or negative, will forecast whether BC is moving in a positive or negative economic direction. The minimum wage changes will also show if businesses are meeting supply and demand to keep their employees with the wage increases. This is a smart move for Christy Clark–her first move as premier of BC—but only time will tell if this is a smartly timed move for her. Hi. This is my first non-movie article. Hope you like it. The BC Liberal Party announced a new leader on Saturday, February 26th. Her name is Christy Clark. She is to replace Gordon Campbell who has served as Premier since 2001 but recently resigned due to low ratings. Being Premier of BC is a big job for the 45 year-old, especially after Campbell’s recent resignation. The big question is how will she and the BC Liberal Party hold in the next provincial election? Currently Premier-Designate Christy Clark is no stranger to politics. If you saw her resume, you’d see she has quite a list of accomplishments. Her first political victory came at the age of 30 when she was elected MLA for the Port-Moody-Westwood riding in 1996. At the start, while the Liberals were the official opposition party in BC, she served as the Official Opposition critic for the environment, children and families and for the public service. As the Liberal Party headed by Gordon Campbell prepared for the provincial election of 2001, she served as the campaign co-chair in which the Party won 77 of the 79 seats. Once Gordon Campbell was sworn in as Premier, she was appointed Deputy Premier and the Minister of Education. She would be appointed Minister of Children and Family Development in January 2004. In September of that same year, she quit provincial politics and did not seek re-election of her MLA position in 2005. She would later seek leadership of the Non-Partisan Association for the Vancouver mayor election that same year, but lost to eventual mayor Sam Sullivan. She’s also a popular media figure too. She was a weekly columnist for the Vancouver Sun and Vancouver Province during the 2005 provincial election and was a television election analyst during the 2006 federal election. She also hosted a Vancouver radio show: The Christy Clark Show from 2007 until she decided to enter the premier leadership back in December. Even though no provincial election has been called yet, she faces a bumpy road for the BC Liberal Party firstly based on past election results. On the provincial side of things, leading provincial parties face a huge electoral loss after their leader resigns as premier. Past history in the last 30 years have proven so. In Manitoba, NDP Howard Pawley, who was elected premier in 1981, resigned. The leadership then went to Gary Doer. The NDP finished the election with the third-most ridings. Doer would have to wait until three more provincial elections before being elected premier of Manitoba. BC premier Glenn Clark, who headed the NDP Party, resigned in 1999 and would be replaced by Dan Miller and Ujjal Dosanjh the following year. The BC NDP, headed by Dosanjh would face a humiliating loss of winning 2 of 79 seats, paving the way for Gordon Campbell and the BC Liberals. Carole James, the NDP leader since, has headed the party in two provincial elections, regaining many seats for the NDP but losing to Campbell both times. Nationally, political parties have had its own dark days when their leader resigns as Prime Minister. In 1984, Pierre Trudeau resigned as Prime Minister and John Turner would be voted head the Liberal Party. In the national election, his Liberal party would lose to the PC Party headed by Brian Mulroney. Turner remains the Prime Minister with the second-shortest leadership. He would head the federal Liberal party in the following federal election in 1988 and would lose to the Mulroney PC’s again. The PC Party would soon face its own party troubles after Mulroney resigned in 1993. Kim Campbell succeeded him. However Campbell and the PC’s would face a crushing defeat in the federal election that same year by winning only two seats. The Liberal’s headed by Jean Chretien would win the federal election. Chretien would be re-elected twice more while Canadian Conservatives would struggle with political parties for many years. The PC Party ran again in 1997, would reconstruct themselves at the Canadian Alliance Party for the 2000 federal election, and would them become the Conservative Party in time for the 2004 election. If past elections aren’t enough for Christy to cause concern, it would be the Campbell leadership, especially in the last year. Campbell’s leadership has always been through a rocky road ever since he was elected but he would be hit hardest in 2010 upon introducing the HST. The introduction of the tax, and the rapid implementation if it, proved to be very unpopular amongst British Columbians. Soon after, the polls had him at an approval rating of just 9%, the lowest of any provincial premier. This was cause for him to resign in November of 2010. Now despite party problems, Christy Clark has had some political problems of her own once she’s sworn in on March 14th. As Minister of Education, she introduced changes like stronger parental power, increased accountability and provided greater parental choice in the flexibility in the school system. This proved unpopular with teachers, school board members and union officials as they believed it resulted in funding gaps. She also sought to increase the independence of the BC College of Teachers against strong opposition from the BC Teachers Federation. She also has allegations against her regarding a BC Rail scandal when she was deputy premier, although nothing has been proven against her. Those could hurt her come election time. Currently no provincial election date has been set, and there may not even be one for a full year. Dawn Black is currently interim leader of the BC NDP Party, succeeding Carole James. Jane Sterk leads the Green Party. The BC Conservative Party is not associated with the national Conservative Party and may have a slim chance in the election. Nevertheless all opposition parties have a good chance at rivaling Clark and the Liberals in the eventual provincial election. In this period of time, Sterk and Black have to prove themselves worthy of the office of provincial Premier. Black already has a lengthy resume of her own political accomplishments while Sterk has yet to prove herself. In the meantime, Clark can use the time to her advantage to improve her political image and the image of the Liberal Party in this post-Campbell era as an effort to win the next election. She would also have to use the time to prove she is worthy of being Premier of British Columbia. With the next provincial election happening anytime, Christy Clark arrives at the Premier’s desk with a lot of baggage of the Campbell Administration and of her own doing. Despite it all, only time will tell whether she has what it takes to be Premier of British Columbia and whether she and the BC Liberals deserve to win the election.